I have been lugging around a bag of old sheets for years. From closet to closet--across state lines, even. 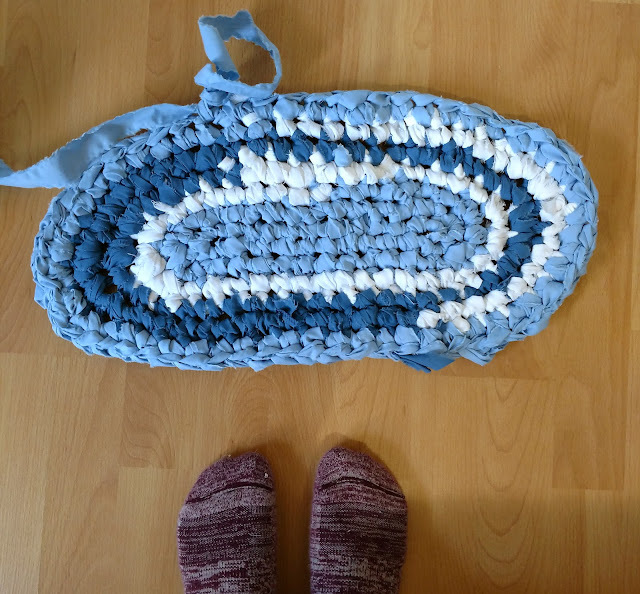 I had the idea that someday I'd like to try my hand at making a rag rug. Well, I've finally bit the bullet. You look at a rug and think it's going to be a big, long-term project -- about on par with an afghan. But it's actually going a lot easier and quicker than I expected! 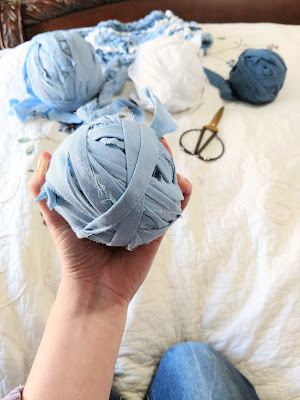 Ripping the sheets and turning them into "yarn" actually seems like the most time-consuming part of the process. 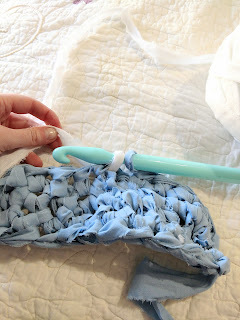 What I'd really like to do is arm-knit one of those amazing-looking, trendy, chunky blankets. But the material for those is expensive. So hey! Let's do this free stash-whittling project instead, right? Also, our floor is kind of cold and un-insulated, so I was thinking two small rugs on either side of the bed would be pretty great to have on these chilly mornings. I'm guessing you probably have some threadbare, unnecessary sheets laying around in some closet or other, so you can join me! 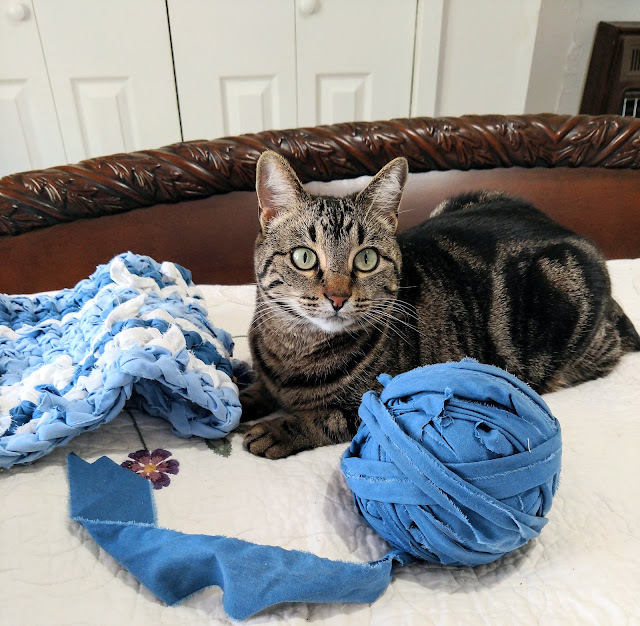 For these rag rugs, I'm using some twin-sized blue and white sheets that I rescued from a box my parents were sending to the Goodwill. Larger items make for longer strips of material -- longer strips make for less joining. So bed sheets are ideal! You can use pretty much anything, though. Sheets, towels, t-shirts, para-cord, plastic grocery bags....You really just need to have a lot of the same kind of material. To begin with, you need to turn your material into "yarn" Start by tearing it into strips. 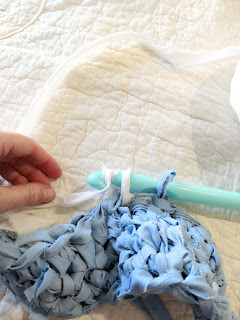 For mine, I'm tearing my sheets into strips about 1.5-2 inches wide and using a size Q crochet hook (like this ). This is making a pretty chunky design, so if I were to do it over again, I might try 1" strips with a P sized hook. 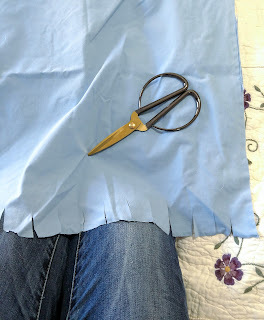 I used a scissors to get the tears started -- but after that, if you're using something cotton with a straight, non-stretchy weave, you can just rip and the strips will stay fairly straight. Once you have a pile of strips, you'll want to join them. 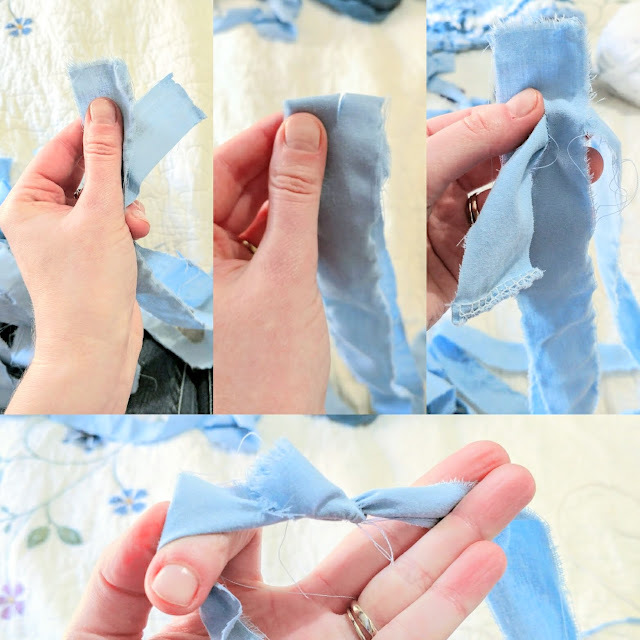 A lot of people advocate sewing the strips end to end, but I'm going to share a no-sew method. Because I'm lazy like that. It's a little bulky to crochet around the joins, but I haven't found it that bothersome, and I'm just pushing the "lose ends" to the back of the rug. So first, you will hold two strips together, one in front of the other. Fold them both over about an inch, then cut a small slit through the fold. Unfold them, but keep them together. You should have created a buttonhole like slit through both strips. Now, take the tail end of the front strip and pull it through the slit back to front. This is important, because if you pull it through the wrong way it will just pull all the way through when you tighten it. 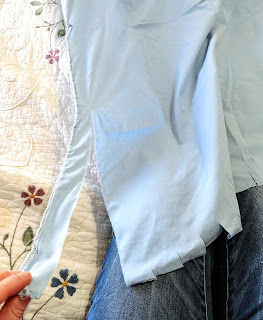 To give you an idea of size, for this tutorial I just did a pillowcase. It made a ball about the size of my hand. Whole sheets are fun -- they get to be more bowling ball sized! Once you have a few good sized balls -- I'd say at least one in each of your colors -- you're ready to start crocheting. Alternatively, you could just join all your strips end to end, switching back and forth between the colors, and make one big ball. But if you want a little more control over the design, choosing colors as you go along, keep them as separate balls and I'll show you how to switch colors on the fly.Right ho. I decided to make oval mats -- one for either side of the bed. The word on the street is that you should make your foundation change about half the length that you want your finished rug to be. I ended up chaining 12, and then one extra to be part of the 1st single crochet. 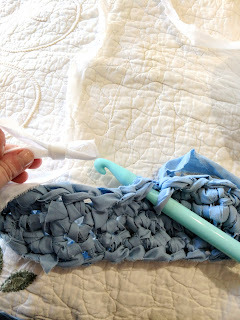 To get started, single crochet into each of your chains. When you reach the second-to-last chain, do two single crochets into the chain. Then two single crochets into the last chain. 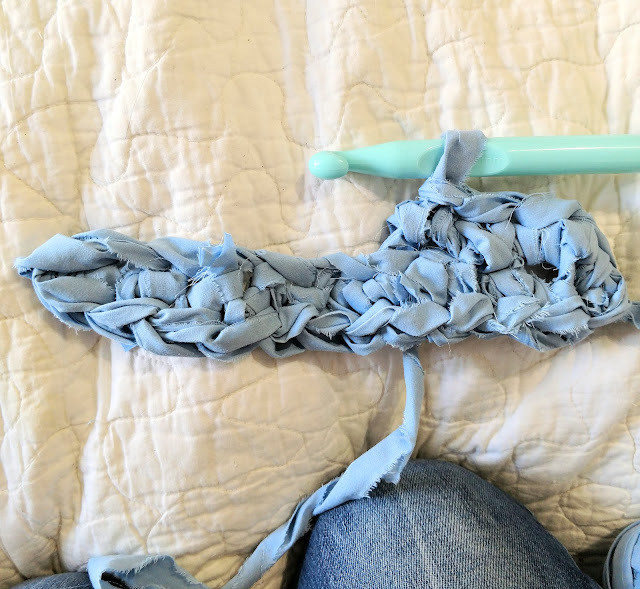 Then rotate it, (not turn, just rotate), and do 2 more single crochets--into the other side of the first chain where you made 2 single crochets instead of one. Single chain across the chains all the way back to where you started. Basically, you'll keep going around and around and around until you reach the size you want. Throw an extra stitch into the three stitches at each end of the oval--this will add six stitches per round--to keep it from curling up on you. Then when it's as big as you want it to be, slip stitch to finish! It's not that hard. 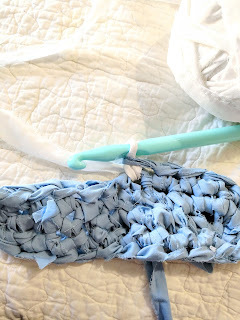 Make a slip-knot in your new color, and then when you go through the stitch to draw up a loop, just draw up that slip-knot. Yarn over with the new color, and pull through. I cut off the old color with a couple inches of tail, and then crochet it in the next time I come around. If you enjoyed this tutorial, please feel free to share! :) And if you still have some fabric scraps you need to use, once upon a time I posted this DIY Rag Wreath! What are you working on this winter?